The March OPEC Monthly Oil Market Report is out with the February production data. All data is through February 2018 and is in thousand barrels per day. 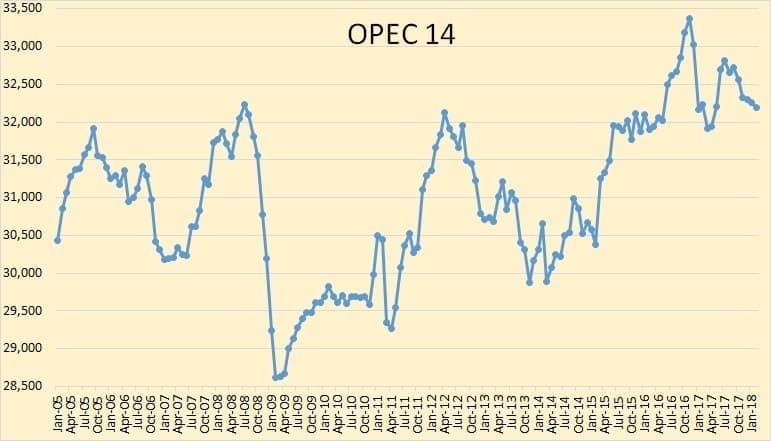 OPEC crude only production was down 77,000 barrels per day in February but that was after January production had been revised downward 40,000 barrels per day. 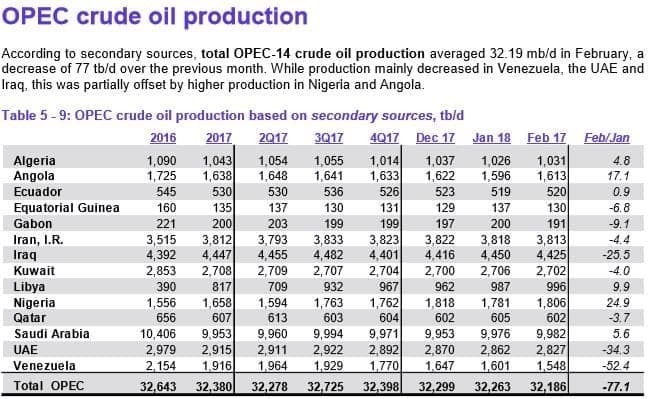 It seems most OPEC countries want to say they are producing less than what “secondary sources” say they are producing. Either they are correct, or they are cheating on their quota. 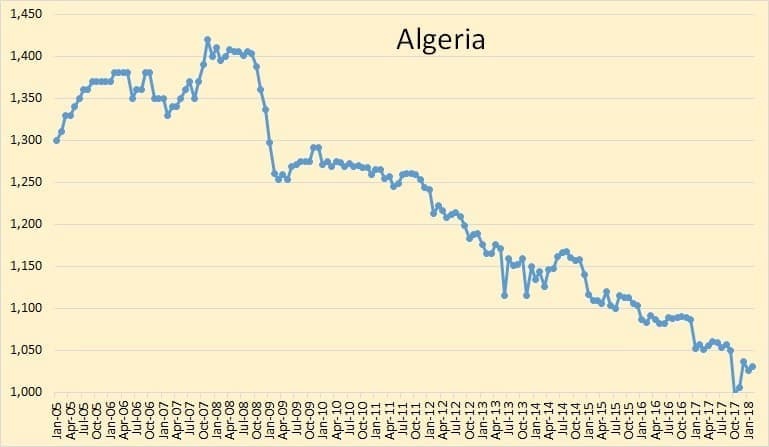 Not much happening in Algeria. They just continue their slow decline. 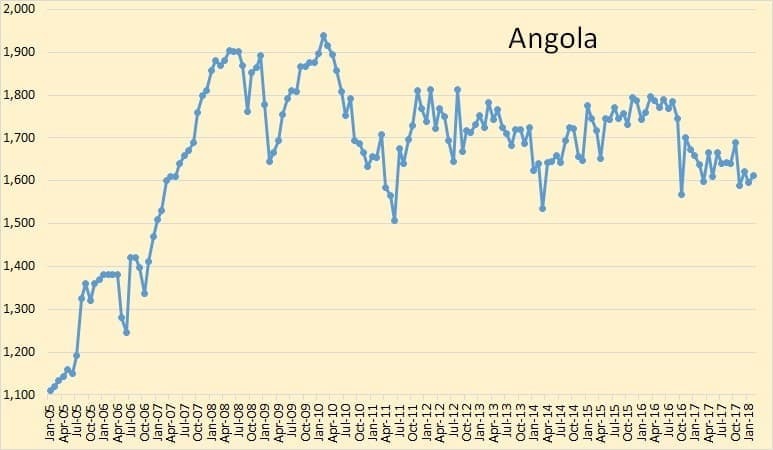 Angola seems to be holding steady. 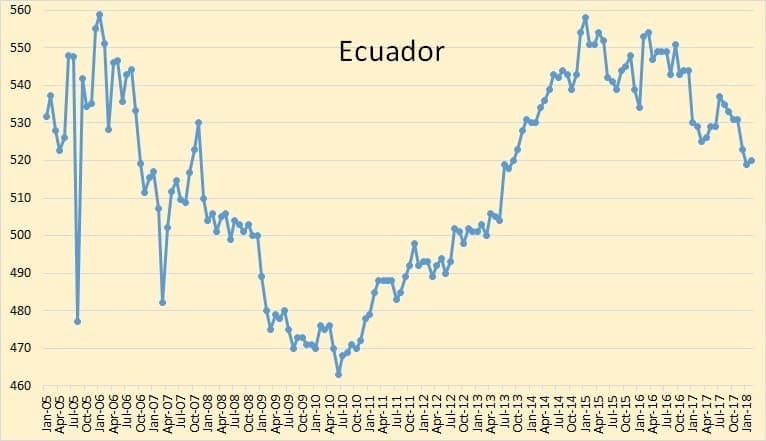 Ecuador was up less than a thousand bpd in February, but their decline continues since their 2015 peak. 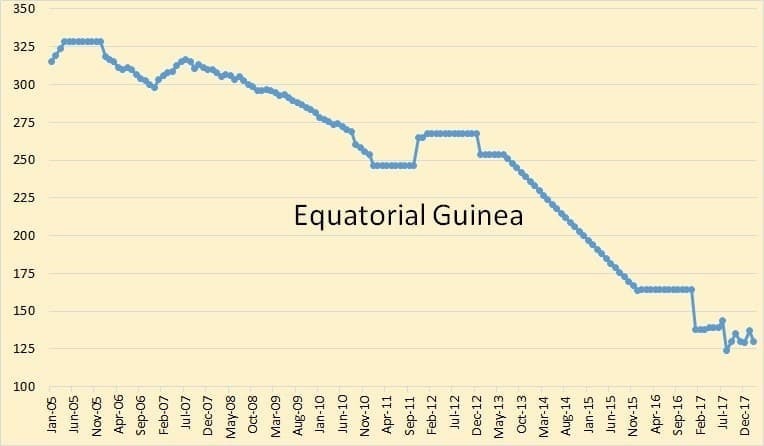 Nothing much is happening in Equatorial Guinea. 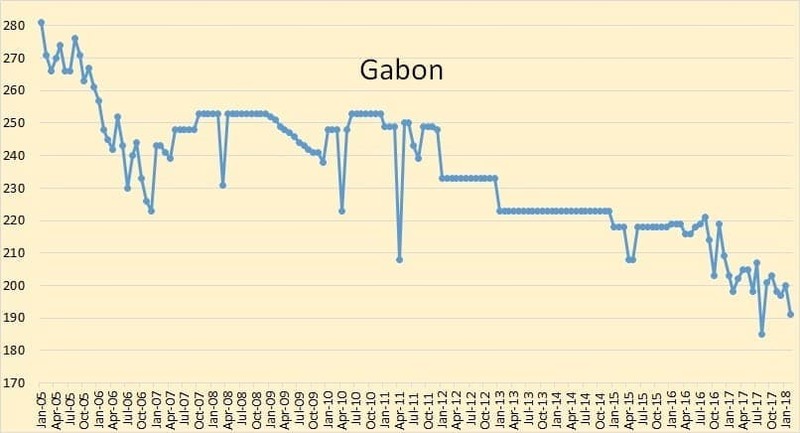 Gabon is another of those low producers where not much is happening. Don’t know why they joined OPEC. For the prestige I suppose. 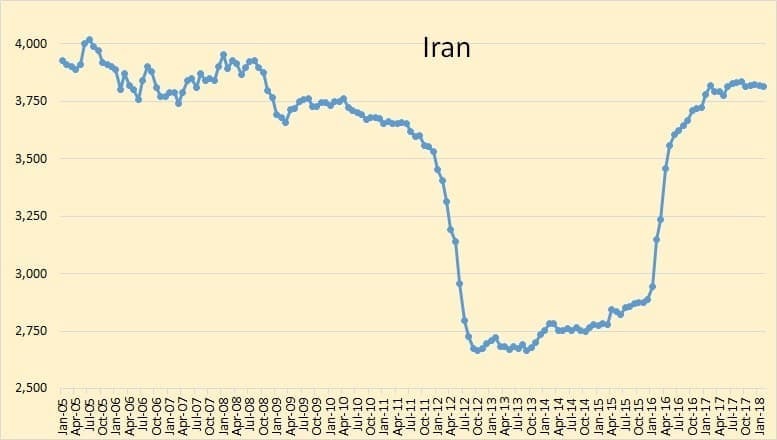 Iran is obviously producing flat out since they recovered from sanctions. 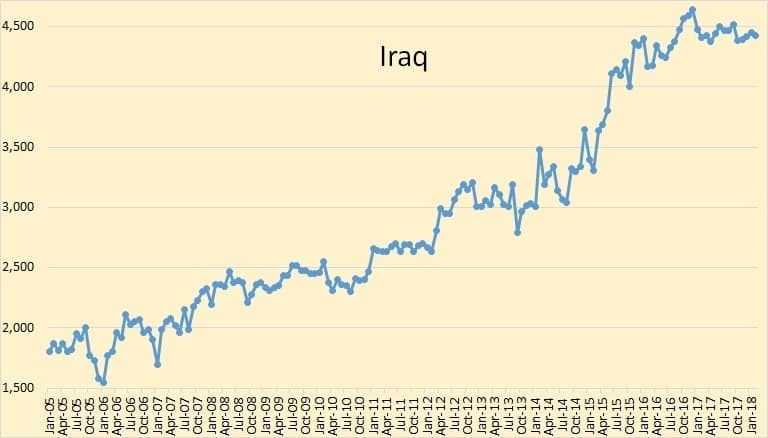 Iraq is another country that appears to be producing flat out. Their average in 2017 was 4,441 thousand barrels per day. 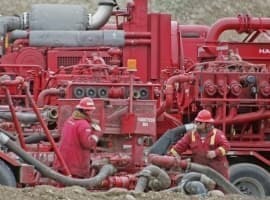 Their February production was only 16,000 barrels per day below that figure. 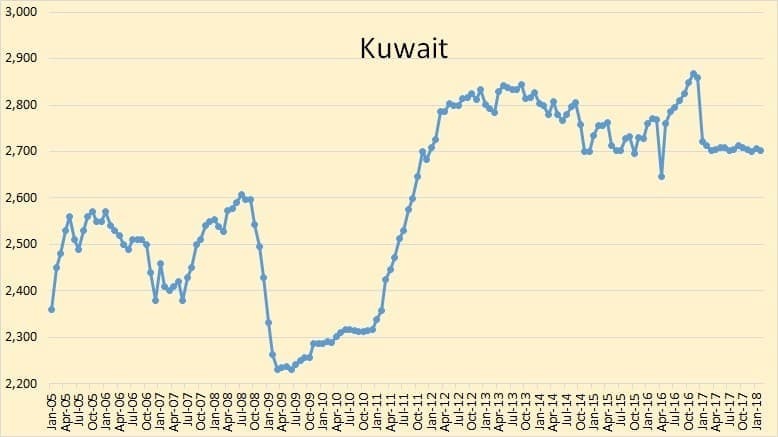 Kuwait has been holding almost flat since January 2017. 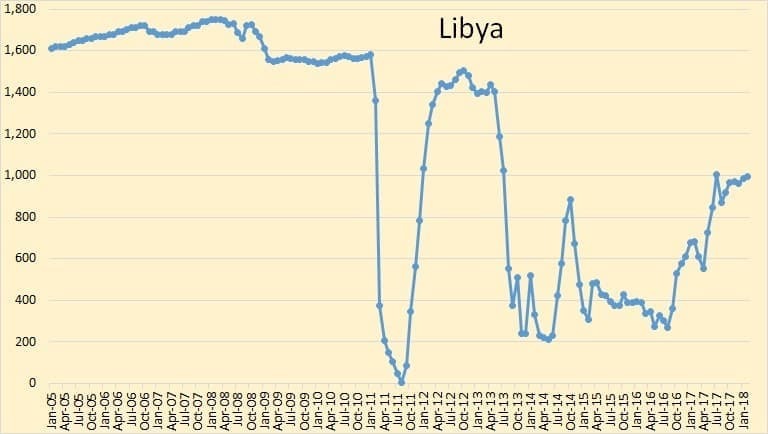 Libya is holding at just under one million barrels per day. Things seem to be settling down in Nigeria. 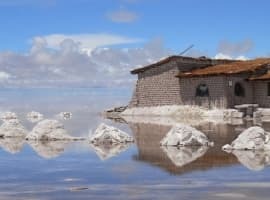 Their political problems continue but their oil production is holding steady at around 1,800,000 barrels per day. 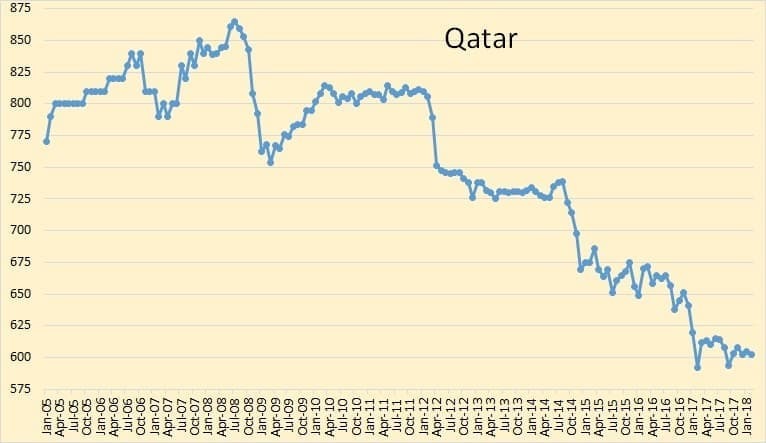 Qatar peaked in 2008 and has been in a slow decline ever since. The UAE increased production in the last quarter of 2016, positioning themselves for the quota cut. Then they cut but they seem to be still cutting. That don’t look good. 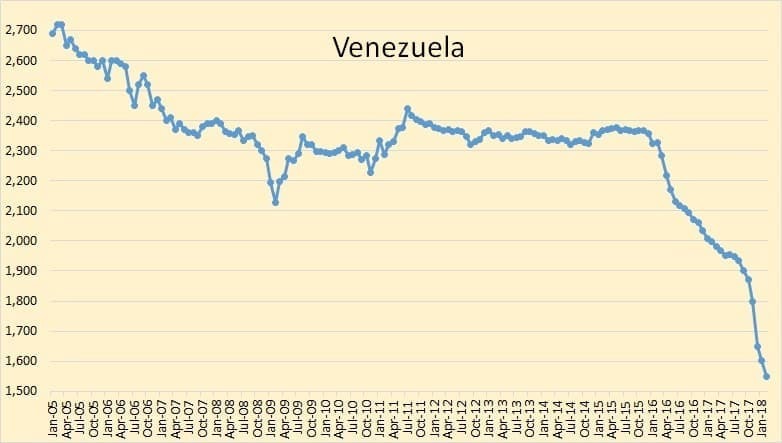 Venezuela is still collapsing, politically as well as oil production wise. I see no hope for them. World oil supply continues to increase slightly. This is all liquids of course. 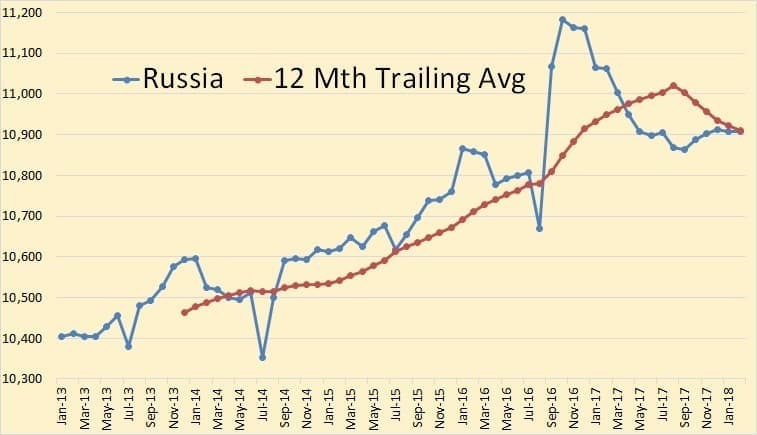 Russia, currently the world’s leading oil producer, leveled out in May 2017 and has been holding relatively steady since. Of course OPEC countries are cheating on their production quotas. They always cheat on their production quotas. 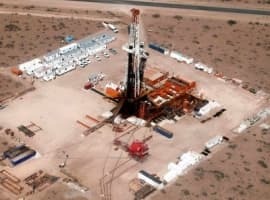 What is amazing, but then not so amazing, is that everyone so easily buys the production numbers they give, and nobody pays much attention to all the extra oil floating around. But then everyone wants to the lower than reality production numbers to be right so the price won't go down. I'm not an expert on the oil industry. I used to be in it which is why I pay some attention, but I do pay enough attention that I find it amusing how the entire industry and support industries are willing to fudge numbers and reality to keep the price up or push it higher. There are always 3 or 4 stories predicting higher demand for oil, lower production numbers, forecasts for $80 plus a barrel oil, or telling us how well OPEC/Russia are holding to their quotas, for every article that suddenly appears with a hit of reality to it. Everyone has to know what's going on, but most are playing the rosy scenario for prices with an occasional cover so it looks like they aren't just lying. Its really rather funny. 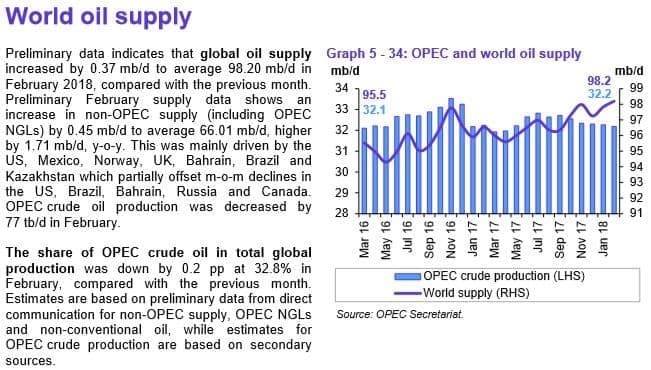 I've read a article after article in the last few months about how well OPEC/Russia are sticking to their quota's, and rebalancing the market, and now this little dash of reality. Tomorrow there will be 3 articles talking about how well OPEC/Russia are holding to quotas , but this is likely the one that's true. Its funny! Is it just me, but I see no connection between the content of this article and the headline. 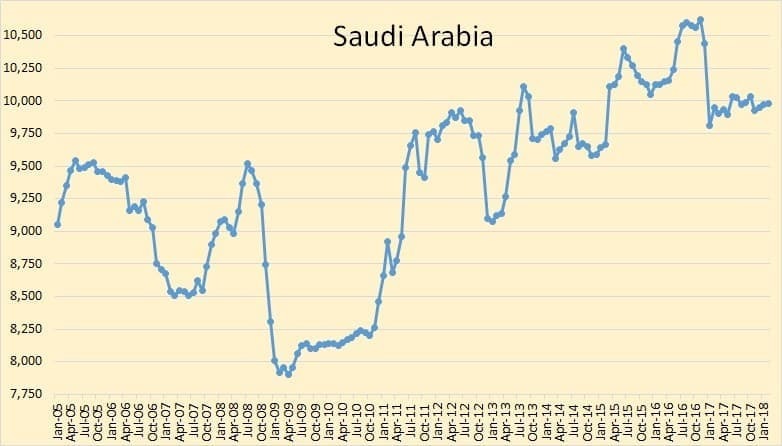 "It seems most OPEC countries want to say they are producing less than what “secondary sources” say they are producing. Either they are correct, or they are cheating on their quota for it." Where was the pudding to prove such a statement? 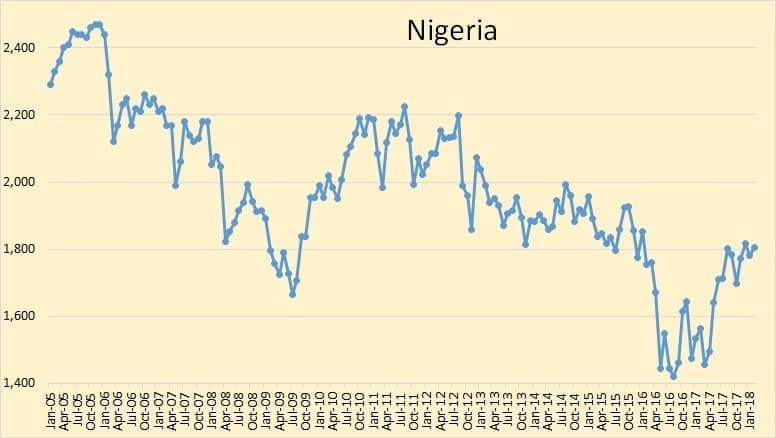 However, I think the historical OPEC production graph is illustrative. If you'll note, after the Great Recession of 2008-09, OPEC cut production to 28.5 million bopd from a pre-cut rate of about 31.5 million bopd (their more typical production range before the big "ramp up" in 2014-16). 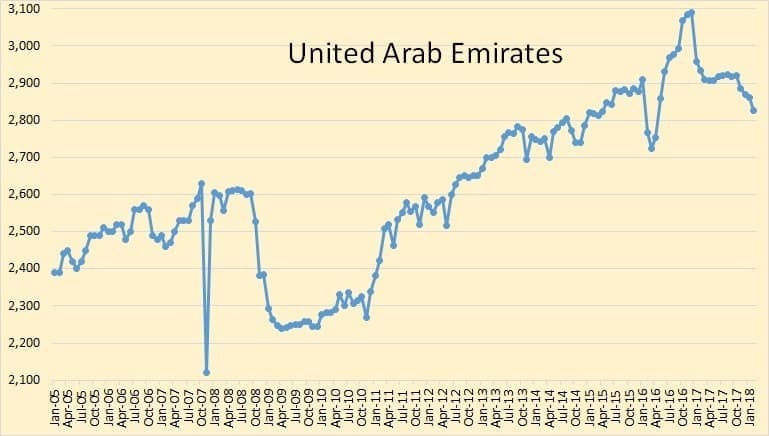 If OPEC wants to get prices up they can do it and will do it if it suits them. Obviously, it does not suit them right now.